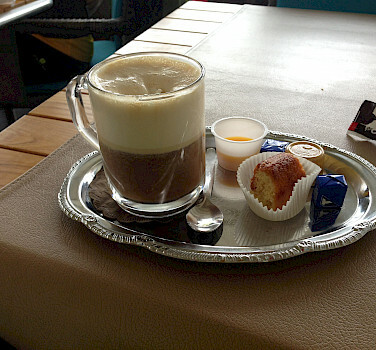 Classic European breakfast, Cappuccino and a sweet. This week's Photo Friday features some neat shots from our Monthly Photo Contest winner for August, Cailtlin Verboon. 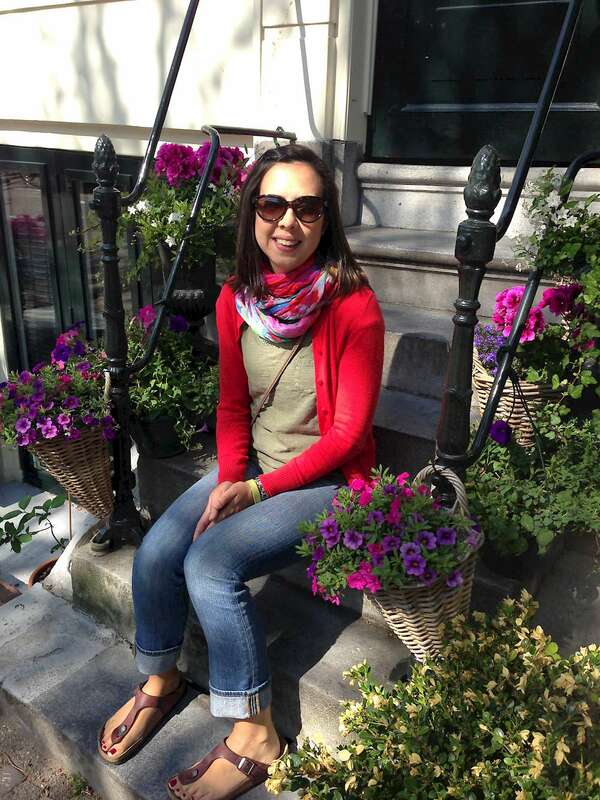 Below is a little bit about Caitlin and her time cycling on our Amsterdam to Bruges Bike & Barge tour. I am a historian who just moved to Washington DC. I enjoy knitting, reading, trying new restaurants, watching college basketball (Go Heels! ), and I am anxiously awaiting my Capital BikeShare key fob so I can start biking around the city. I've only been on 1 Tripsite tour so far because grad school was very time-consuming, but now that I've graduated, I'm hoping to go on many more vacations. My favorite place I've been to so far is Amsterdam, though Gent had the most amazing Belgian waffles. We only got to spend a few hours there so I will definitely go back. My next adventure, though, will be along the Danube. 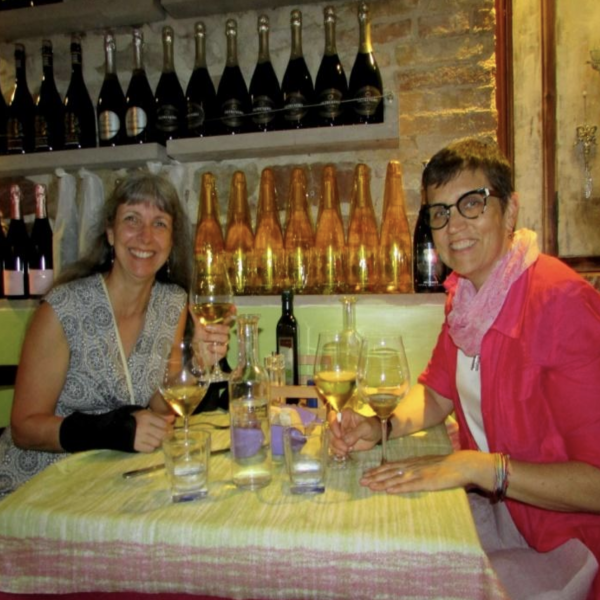 I recently graduated with a PhD in American history in May, so to celebrate, my mom and I decided to take a vacation together before I had to start my real job. We have relatives in the Netherlands and she had always wanted to try a “bike and barge” trip, so this seemed like a perfect opportunity. We loved every moment of it, even when it rained on us (and the captain was so nice, he put all our wet shoes in the engine room and they were warm and dry for us the next morning!) Our tour guide, Jack, was super knowledgeable and knew so many nice restaurants and cafes at all the right moments of our routes every day. Each evening he took us on a walking tour of whatever town or city we were docked near. One of our favorite daily routines was stopping at cafes in little towns to have a mid-morning coffee. 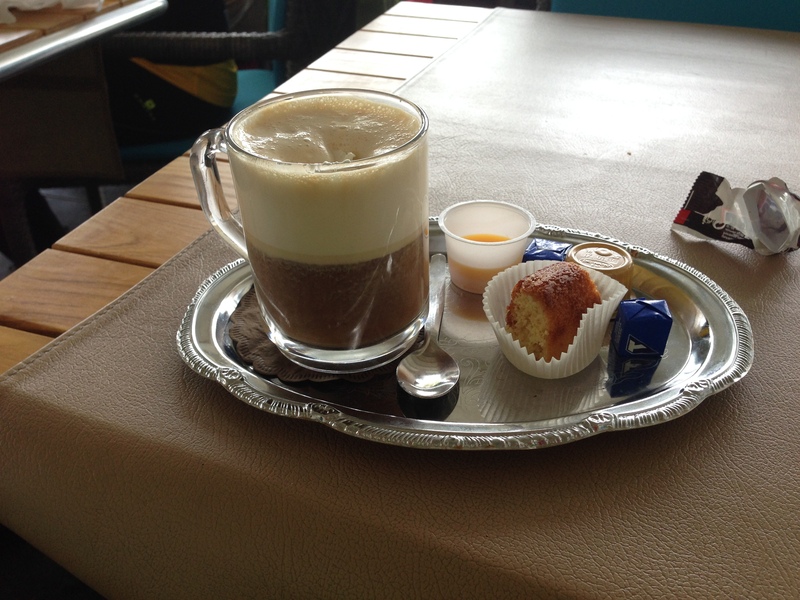 In the Netherlands and Belgium, when you order a cappuccino it automatically comes topped with whipped cream. You also get a small treat to go with it – a cookie, a little biscuit, or even a bit of delicious rum egg custard. I had one every day at our daily morning coffee stop and I really wish I could recreate it here in Washington. The Tripsite tour was the perfect combination of relaxing and active. We biked all day and then came back to the Fluvius – a delightfully spacious and comfortable barge – for home-cooked family style meals, relaxation in the salon and on the roof deck, and beer with all our new friends. We didn’t even have to feel bad for stuffing ourselves with 4 course meals because we knew we’d be back on our bikes the next morning. 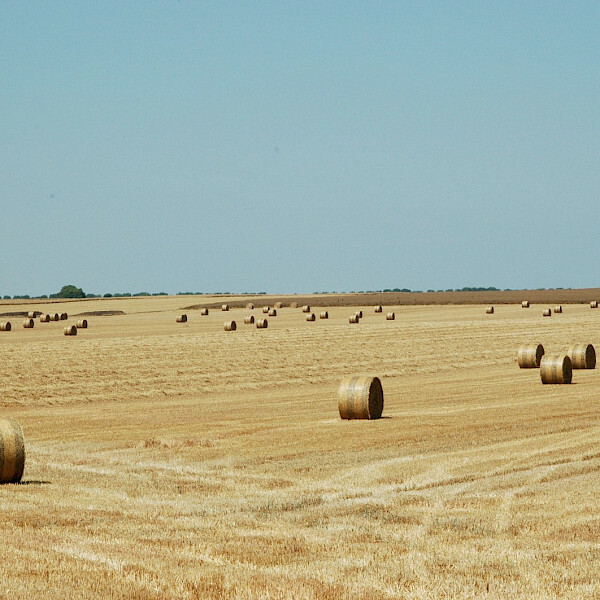 I really can’t imagine a better way to experience the Belgian and Dutch countryside. 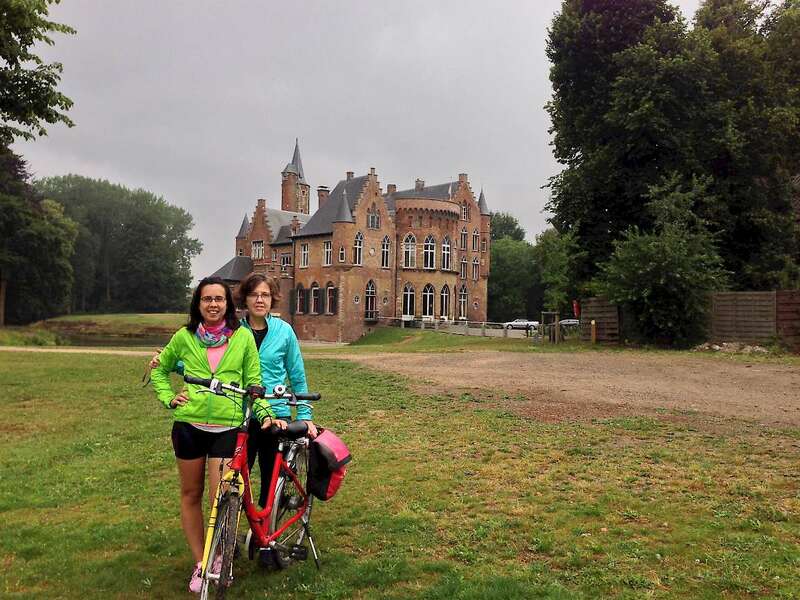 Caitlin and Nancy in front of a castle near Kruibeke, Belgium. 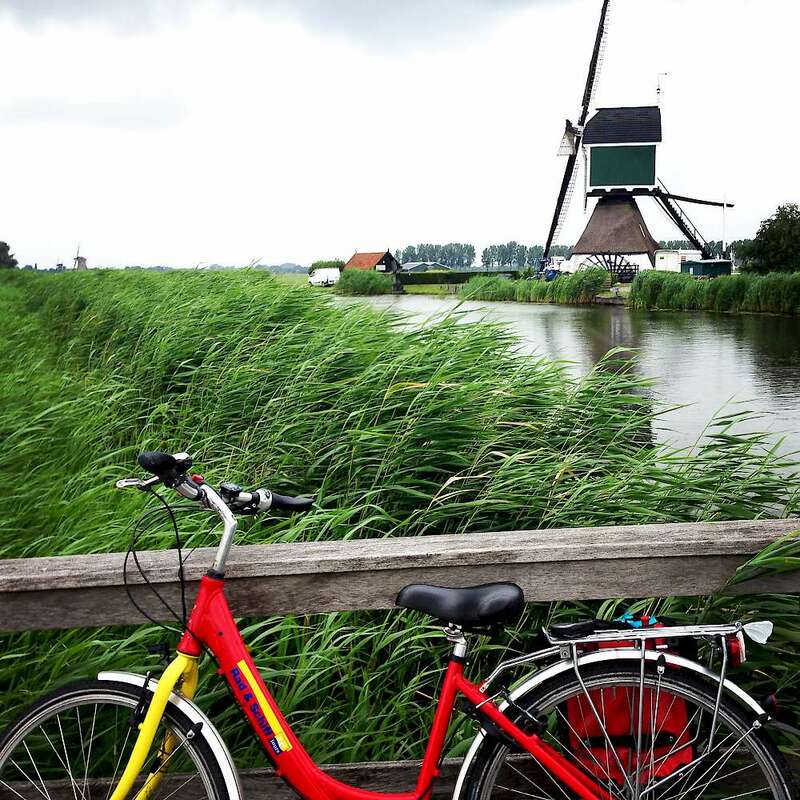 Tilting Windmills: Bikes and windmills, two things the Netherlands is famous for! 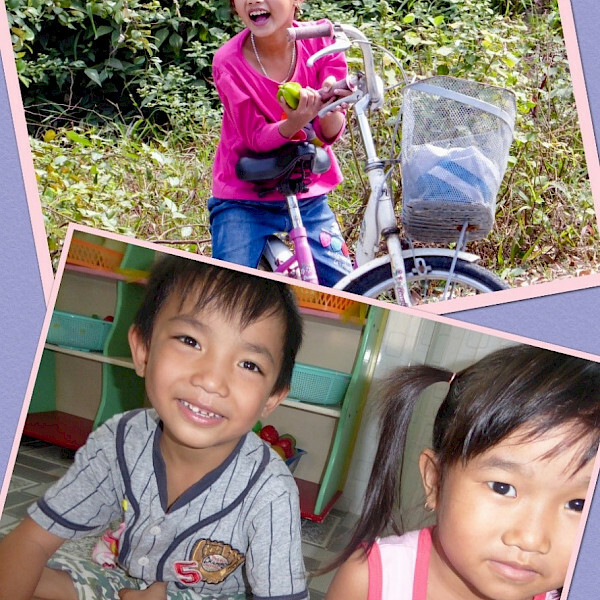 On our first full day of biking, we stopped for lunch (hard-boiled eggs and a cheese sandwich for me, every day!) along a dike with views of a few canals. Little did I realize how impressive the later Kinderdijk would be! 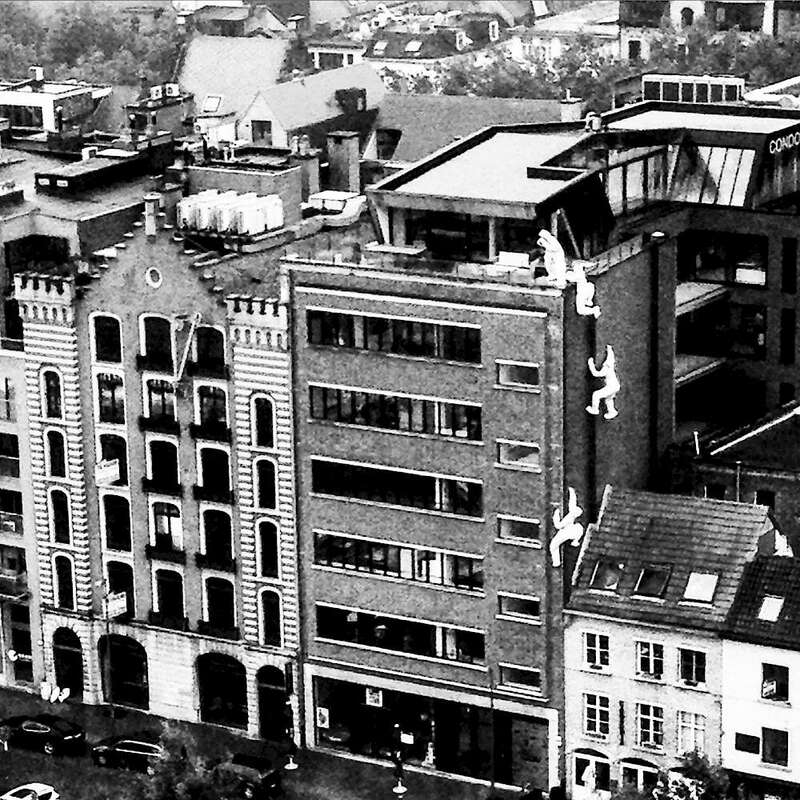 Urban Climbers; Or, that Time in Antwerpen I Mistook Art for Giant Burglars: Before we biked out of Antwerpen, our group stopped at the Museum Aan de Stroom. It is the largest museum in the city and offers great panoramic views. Some of those views were unexpected, like the larger than life figures scaling the side of a nearby building. We found surprising art all along the tour routes. 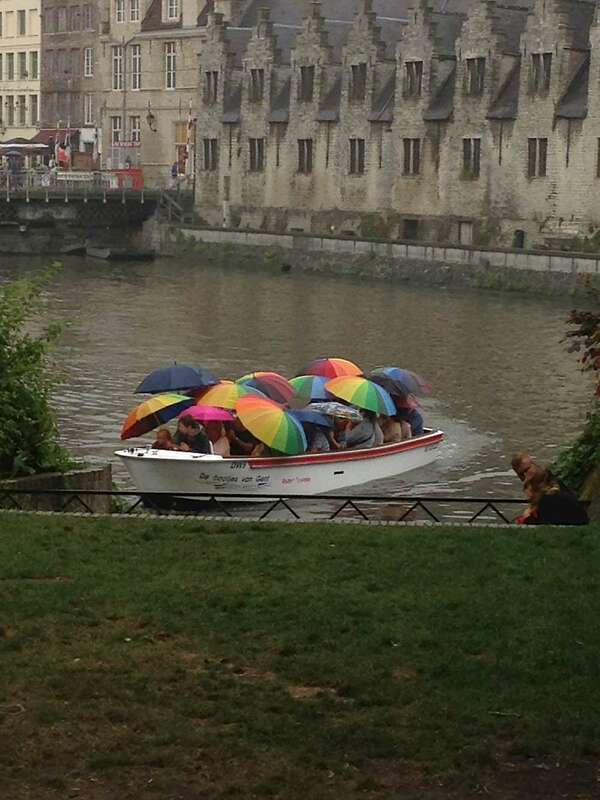 The Umbrellas of Gent: My mom and I spent a few hours walking around Gent, eating Belgian waffles and drinking Belgian beer. 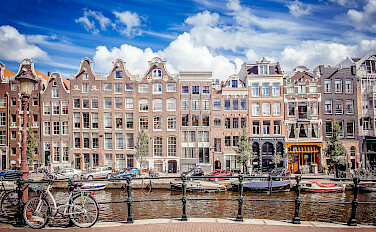 In true Northern European summer fashion, the skies periodically opened on us – and the tour boats in the canal. Right on cue, everyone opened their rainbow umbrellas, giving the gray scene a welcome splash of color. 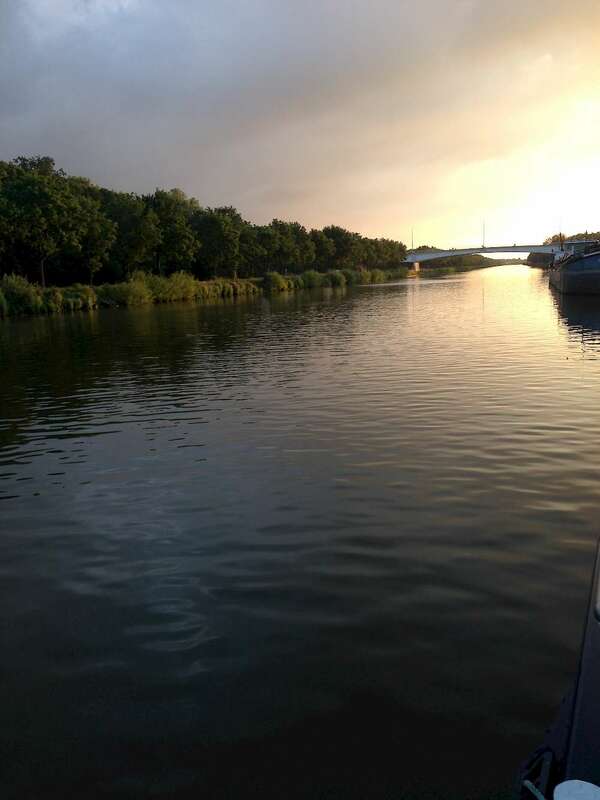 Sunset on the River: The Fluvius was too long to dock right at Gent so we had to spend the evening away from the city. We were rewarded with a beautiful sunset as a preview of the gorgeous weather we enjoyed for the rest of our trip. 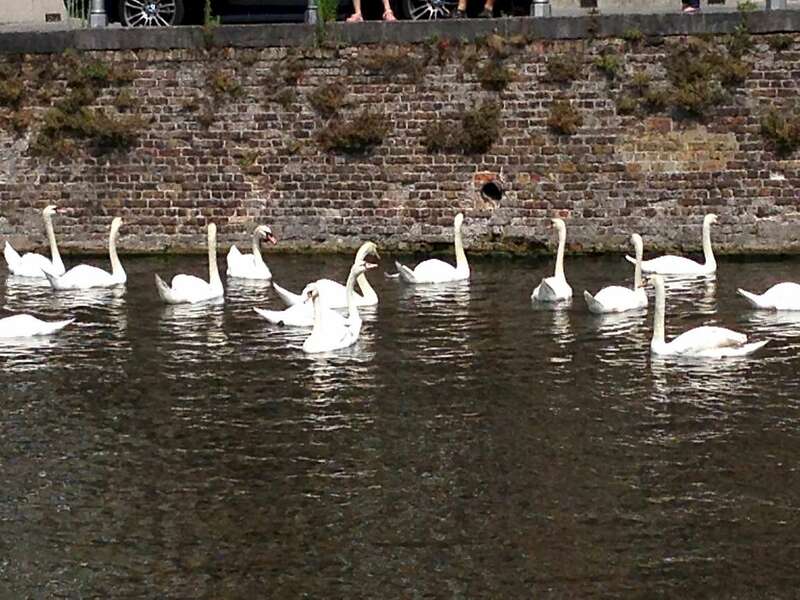 The Swans of Bruges: Bruges’ beautiful canals are the preferred method of transportation for canal tour boats…and the dozens of swans who call Bruges home. All Roads Lead to the North Sea: Well, in my case they do! I was so taken with the sun and the view and the tranquility that I completely missed my turn and took an alternate route to the North Sea. Luckily the bike road system in Belgium is top-notch and I found the rest of my crew calmly eating lunch on the boardwalk. 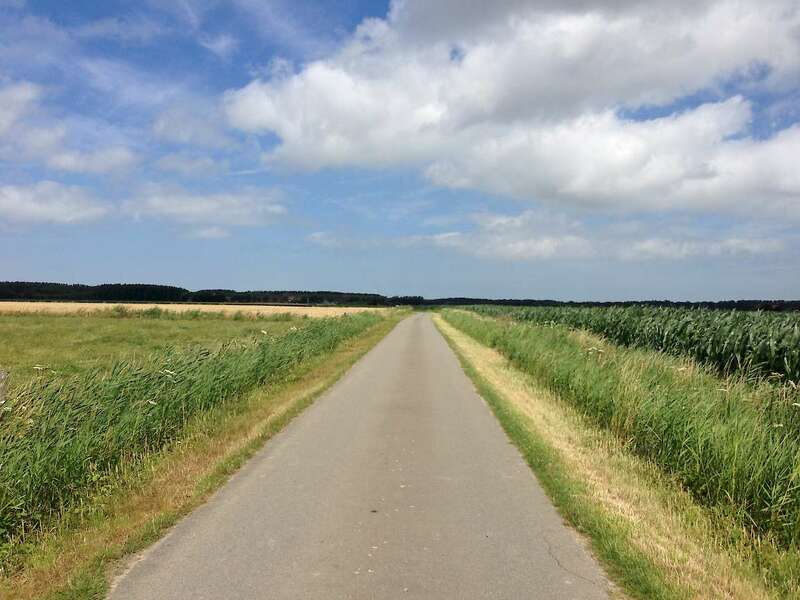 To start planning your next Bike & Boat tour, check out all of our bike and barge tours in the Netherlands.